The re-developed SuperReel by TTi, Australia’s leading manufacturer of tanks and trailers, is available for sale and delivery Australia wide! With new and improved design, the Auto-rewind SuperReel assures the utmost productivity, efficiency and longevity. Used national wide by councils, government bodies, spraying contractors, in both pest control and agricultural industries and farmers, the SuperReel is proven to be the most ergonomic, efficient and user friendly auto rewind reel on the market. Based on customer feedback and years of development, the SuperReel is a winner. A fully enclosed casing to protects the components, and a unique “transport mode” braking technology prevents the hose from unwinding during travel. The stainless steel ball bearings, and stainless steel shaft ensures a lifetime of use without having to be replaced or serviced! » Single channel wireless remote transmits up to 200m in uneven terrain! CHECK OUT THE REST OF AUSTRALIA’S BEST SPRAY EQUIPMENT HERE! Choosing the right sprayer for your application is a decision one of our friendly customer care team would love to help you with! 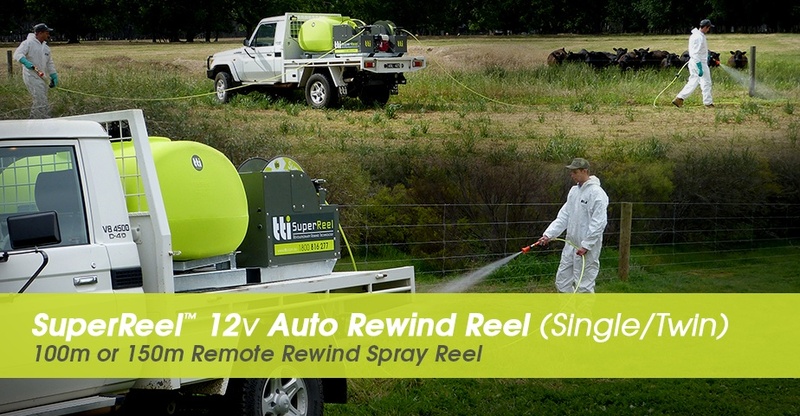 Visit https://www.tti.com.au/index.php/tti-products/spray-equipment/field-sprayers-with-super-reel.html to see the many options made available, or call 1800 816 277 for more information.